Eutelsat 9B is a commercial communications satellite built by Airbus Defence and Space for operation by Eutelsat S.A. headquartered in France. Carrying a powerful all-Ku Band payload, Eutelsat 9B also hosts a communications terminal for the European Data Relay Satellite System EDRS. 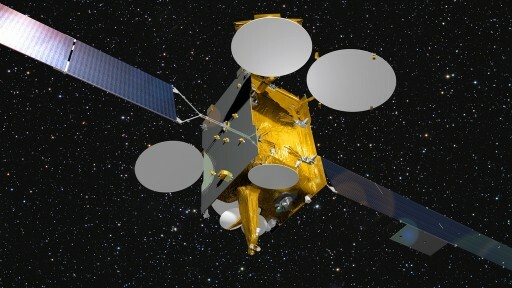 The contract for the construction of Eutelsat 9B was awarded to Airbus Defence and Space (formerly Astrium) in late 2011 with an initial launch date in 2014, eventually postponed to early 2016 – also owed to Proton launch failures in 2014 and ’15 that slowed down the rocket’s launch pace. The satellite has been designed to serve as a high-capacity video relay terminal, to the stationed in Eutelsat’s 9°E video neighborhood. The Eutelsat 9 satellite is outfitted with a powerful payload comprised of 66 Ku-Band transponders connected to a broad European widebeam and four regional beams covering European countries. All five footprints employ frequency reuse, optimizing overall bandwidth. Eutelsat 9B will increase Eutelsat’s video distribution capacity in Europe, providing wide coverage for channels aiming for maximum reach among customers spread all across Europe. 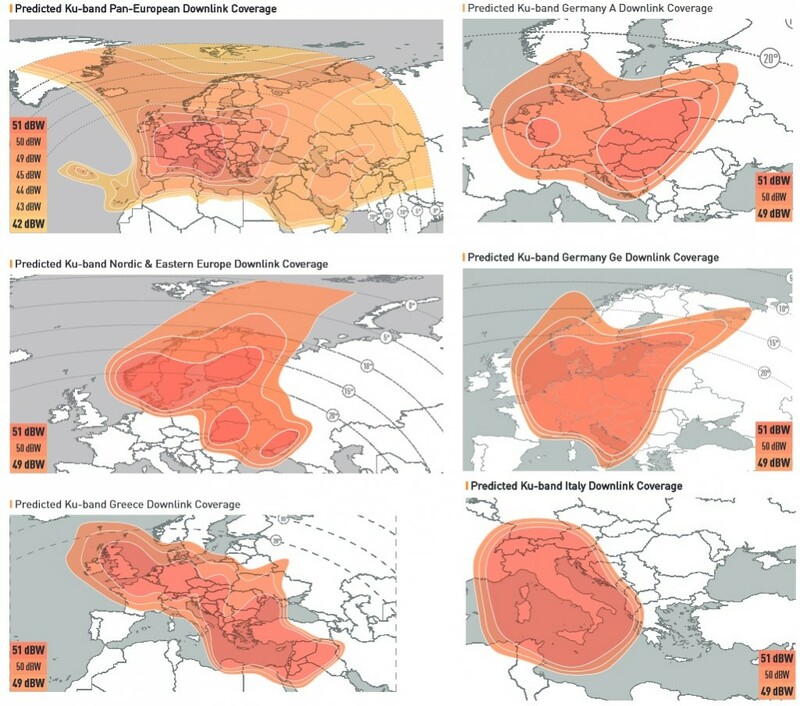 Regional channels addressing linguistic markets in Italy, Germany, Greece and the Nordic regions will be accommodated by the satellite. 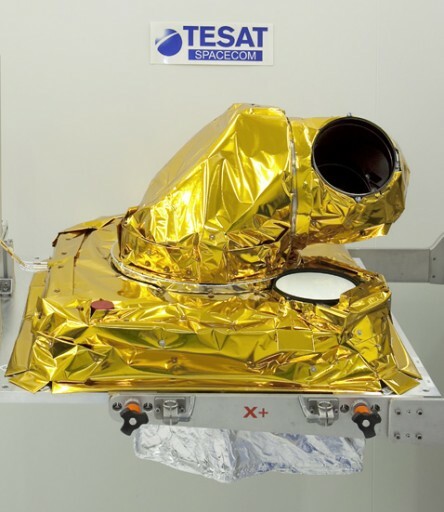 The Eutelsat 9 spacecraft hosts the first data relay payload for the European Data Relay System (EDRS) in a Public Private Partnership between the European Space Agency and Airbus Defence and Space. 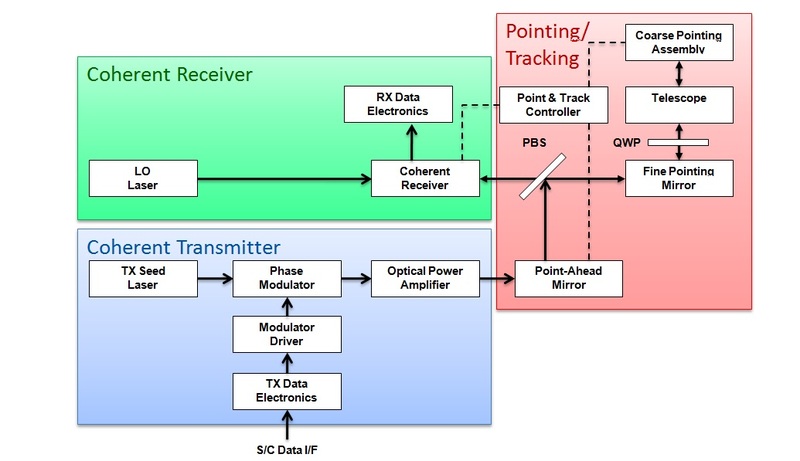 EDRS represents a laser communications system for high-speed data relay between satellites in Low Earth Orbit and receivers in Geostationary Orbit, increasing the downlink data volume and reducing latencies in data availability. The LEO-GEO communications link can achieve high data rates and the Geostationary Satellite will use a Ka-Band link to a ground station to relay the data to the ground. The Laser Communications Terminal on the LEO and GEO craft consists of a 2.2-Watt laser and a telescope with a 135-millimeter aperture to be able to transmit information over a distance of more than 45,000 Kilometers. 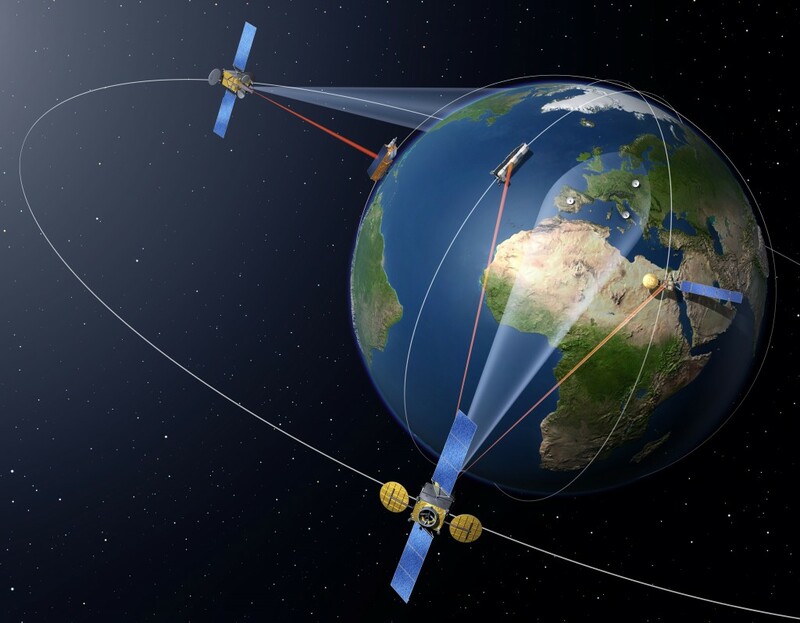 The laser communications link between the LEO Satellite and the terminal on the Geostationary Spacecraft reaches a data rate of 1.8Gbit/s while the Ka-Band link from GEO to the ground station reaches 600Mbit/s. A direct LEO-to-Ground downlink is also possible and could reach data rates of up to 5.6Gbit/s. Two EDRS terminals in Geostationary Orbit will build the initial system with a wide coverage area, to be achieved in 2017. 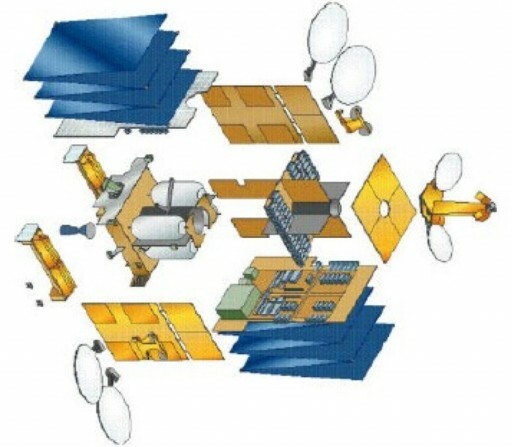 Eutelsat 9B includes a hosted EDRS payload while EDRS-C has the communications terminal as primary payload and a commercial communications system as hosted payload by operator HYLAS. Another two EDRS hosted payloads are set to launch by 2020 to reach global coverage and redundancy of the system. EDRS ground stations are located in Germany, Belgium and the United Kingdom with a central Mission Operations Center in Ottobrunn, Germany and a backup in Redu, Belgium. Data downlink is also possible directly to customer’s processing centers. The first users of EDRS are the Sentinel-1 and 2 Earth Observation Satellites and the European Columbus Module of the International Space Station will also use EDRS for daily communications. Airborne users in the form of crewed and remote-controlled platforms can also use the EDRS system. The Laser Communications Terminal LCT resides on the Earth-facing deck of the Eutelsat 9B satellite with the base plate of the Frame Unit System tiled by 15° to the deck plane so that the Coarse Pointing Assembly’s azimuth rotation axis is removed from the edge of the operational field of view. The Coarse Pointing System includes two articulations with azimuth and elevation rotation, azimuth being perpendicular to the Frame Unit System. 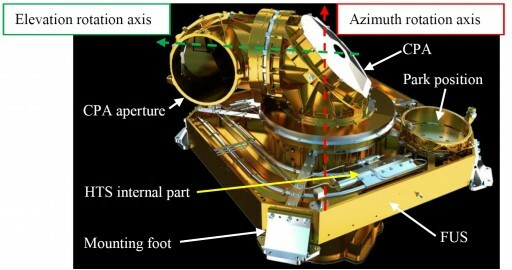 The Coarse Pointing Assembly includes mirrors to relay the incoming beam to the Pointing & Tracking Assembly where the fine-pointing mirror is located, capable of tracking the beam in a closed-loop scheme with fine steering mechanisms for relay of the laser beam to the telescope and optical encoder. The optical signal is converted to a digital data stream in the Data Processing Unit and modulators convert the signal for relay to the RF conditioning system comprised of a Microwave Power Module and Multiplexers. The signal is then amplified and sent to the ground in Ka-Band. The 1.8Gbit/s data stream from the LCT is split into two or four data streams to be picked up by the corresponding modulators with useful information rates of 300 or 450Mbit/s and encoded data rates of 600Mbit/s. The downlink uses one 450MHz channel bandwidth per polarization operating at a radio frequency of 26GHz. The EDRS transmitter receives data from the spacecraft that is then put through modulators coupled to the seed laser to generate the modulated laser output which is then routed through an optical power amplifier to the point-ahead mirror to enter the optical path through the pointing assembly. The forward link from Earth, through GEO, to LEO is available for data rates of 1Mbit/s for a Ka-uplink and optical relay, and between 500bit/s and 4kbit/s for an optical uplink from Earth to GEO. The EDRS-A system has a total mass of 170 Kilograms and requires under 800 Watts of electrical power. The EDRS-A node alone will be capable of a daily data handling capacity on the order of 16 Terrabytes. Once fully operational, EDRS can handle 50TB of data per day. 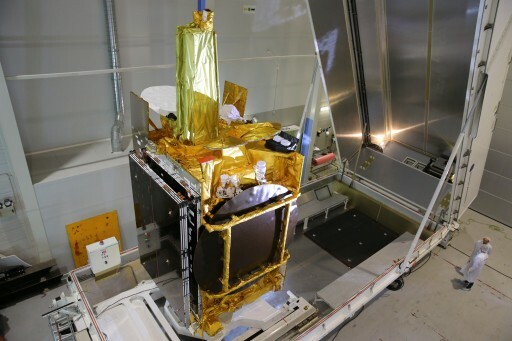 Eutelsat 9B has a launch mass of 5,162 Kilograms, based on the Eurostar-3000 satellite platform. The spacecraft stands 7.5 meters tall and, in orbit, its deployed solar arrays have a span of over 30 meters. 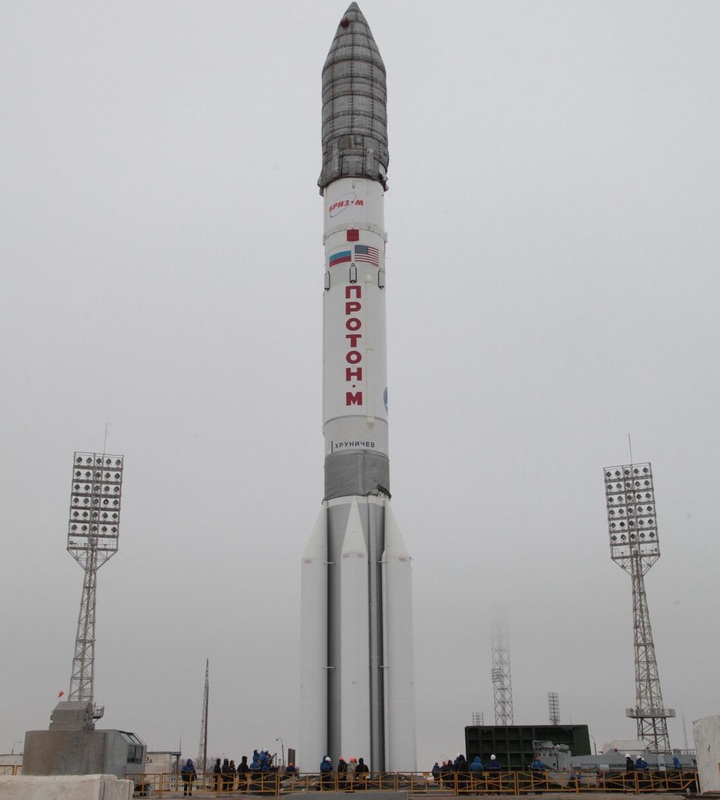 The platform is capable of hosting communications payloads with a total power exceeding 16,000 Watts. The spacecraft platform can support a high degree of customization to be able to support a variety of payloads including commercial communications and military payload packages. Eurostar-3000 made its first launch in 2004. Two deployable solar arrays are used for power generation featuring triple-junction Gallium-Arsenide solar cells. Power is stored in onboard batteries while a Power Conditioning and Distribution Unit regulates the satellite’s power bus and controls the state of charge of the batteries. 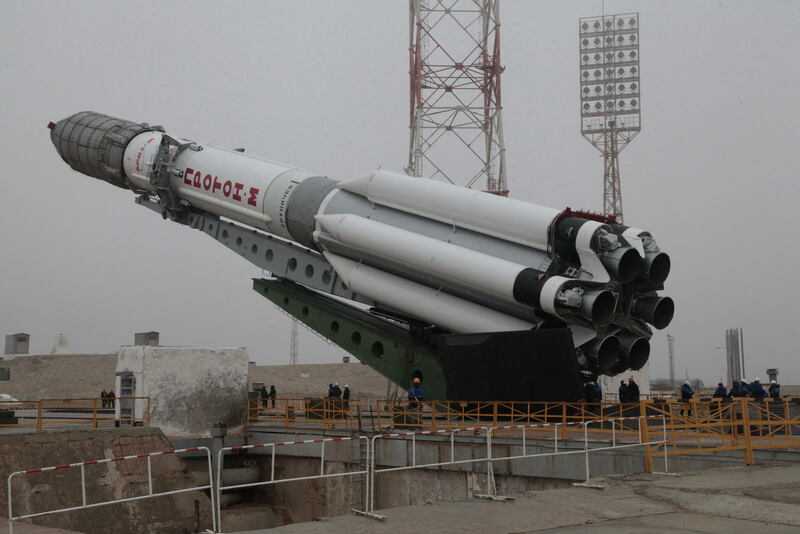 At the start of its mission, E9B will generate a total payload power of 15,000 Watts.